In my article “Using Integers to Check a Floating-Point Approximation,” I briefly mentioned “bigcomp,” an optimization strtod() uses to reduce big integer overhead when checking long decimal inputs. bigcomp does a floating-point to decimal conversion — right in the middle of a decimal to floating-point conversion mind you — to generate the decimal expansion of the number halfway between two target floating-point numbers. This decimal expansion is compared to the input decimal string, and the result of the comparison dictates which of the two target numbers is the correctly rounded result. In this article, I’ll explain how bigcomp works, and when it applies. Also, I’ll talk briefly about its performance; my informal testing shows that, under the default setting, bigcomp actually worsens performance for some inputs. For decimal inputs that don’t qualify for fast path conversion, David Gay’s strtod() function does three things: first, it uses IEEE double-precision floating-point arithmetic to calculate an approximation to the correct result; next, it uses arbitrary-precision integer arithmetic (AKA big integers) to check if the approximation is correct; finally, it adjusts the approximation, if necessary. In this article, I’ll explain the second step — how the check of the approximation is done. David Gay’s strtod() function does decimal to floating-point conversion using both IEEE double-precision floating-point arithmetic and arbitrary-precision integer arithmetic. For some inputs, a simple IEEE floating-point calculation suffices to produce the correct result; for other inputs, a combination of IEEE arithmetic and arbitrary-precision arithmetic is required. In the latter case, IEEE arithmetic is used to calculate an approximation to the correct result, which is then refined using arbitrary-precision arithmetic. In this article, I’ll describe the approximation calculation, which is based on a form of binary exponentiation. In general, to convert an arbitrary decimal number into a binary floating-point number, arbitrary-precision arithmetic is required. However, a subset of decimal numbers can be converted correctly with just ordinary limited-precision IEEE floating-point arithmetic, taking what I call the fast path to conversion. Fast path conversion is an optimization used in practice: it’s in David Gay’s strtod() function and in Java’s FloatingDecimal class. I will explain how fast path conversion works, and describe the set of numbers that qualify for it. The fast path in David Gay’s decimal to floating-point conversion routine relies on this property of the first twenty-three nonnegative powers of ten: they have exact representations in double-precision floating-point. While it’s easy to see why powers of ten up to 1015 are exact, it’s less clear why the powers of ten from 1016 to 1022 are. To see why, you have to look at their binary representations. Producing correctly rounded decimal to floating-point conversions is hard, but only because it is made to be done efficiently. There is a simple algorithm that produces correct conversions, but it’s too slow — it’s based entirely on arbitrary-precision integer arithmetic. Nonetheless, you should know this algorithm, because it will help you understand the highly-optimized conversion routines used in practice, like David Gay’s strtod() function. I will outline the algorithm, which is easily implemented in a language like C, using a “big integer” library like GMP. they are just zeros and ones. Switches — on and off! Last week I introduced my son’s third grade class to binary numbers. I wanted to build on my prior visit, where I introduced them to the powers of two. By teaching them binary, I showed them that place value is not limited to base ten, and that there is a difference between numbers and numerals. My presentation was based on base-ten-block-like imagery, since I knew the students were comfortable expressing numbers with base ten blocks. I thought extending the block model to other bases would work well. I think it did. Some people are curious about the binary representations of the mathematical constants pi and e. Mathematically, they’re like every other irrational number — infinite strings of 0s and 1s (with no discernible pattern). In a computer, they’re finite, making them only approximations to their true values. I will show you what their approximations look like in five different levels of binary floating-point precision. Unconscious incompetence: You don’t know what you don’t know. Conscious incompetence: You know what you don’t know. Conscious competence: You know what you know. Unconscious competence: You don’t know what you know. 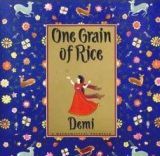 In the children’s book “One Grain of Rice: A Mathematical Folktale” a girl uses her knowledge of exponential growth to trick a greedy king into turning over his stockpile of rice. Hidden in the story are mathematical concepts related to doubling: powers of two, geometric sequences, geometric series, and exponents. I will analyze the story from this perspective, and then discuss my experience reading it to first and third grade students.